A six-month-old infant Asian elephant arrived at Henry Vilas Zoo in 1965. She was so small that two men were able to lift her onto a table, allowing the zoo vet to get a closer look. The zoo named the infant Winkie. She lived in Madison for thirty-five years—through blizzards, ice storms, and sweltering summer heat. In 1982 she was joined by an African elephant calf named Penny. They were chained in place for 16 hours out of every day. Winkie was not happy… Over the years, she attacked her keepers. After much wrangling, Winkie's big day came in September 2000 when she stepped into the Sanctuary's trailer and headed south. She arrived with a hard shell and a small heart. Over these five years in the lush hills of Tennessee she has found the courage to shed her carapace and allow her heart to grow. She loves her human caregivers and has found a true and tender friend in Sissy. So, Happy Valentine's Day, Winkie, from one who loves every bit of you--the frightened warrior who battled every way she knew to escape Madison, the shy creature who reached out to a stranger like me, the stubborn orphan who insisted on keeping her hope alive. Winkie was born in Burma in 1966. As a young calf she migrated with her family across the wilds of Southeast Asia. At approximately one year of age, she was captured and sold into the exotic animal trade, which brought her to the Henry Vilas Zoo in Madison, Wisconsin. She has shared her small zoo space since infancy with others, most recently an African elephant named Penny. During her time at the zoo, Winkie was managed free-contact-dominance, which is a standard form of elephant management. Winkie's response to being dominated was to lash out at new keepers being trained to dominate her. She hurt several would-be elephant keepers and visitors in her thirty-year stay at the zoo, earning a reputation as a dangerous elephant. As a result of an antiquated elephant exhibit, lack of funds to renovate the exhibit in the immediate future, and a request by USDA to improve the exhibit or relocate the elephants, the Henry Vilas Zoo decided it would be in the best interest of their elephants and staff to place Winkie in another institution. After thoroughly investigating the options, the difficult decision was made. Penny and Winkie were separated. Penny, being young and reproductively viable was sent to a facility where she would be bred. 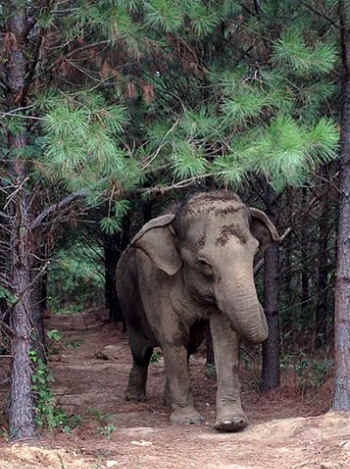 Winkie was allowed to retire to the Elephant Sanctuary where she would not be bred. At 12 noon, September 12, 2000, Winkie arrived at The Elephant Sanctuary. She was immediately comfortable with the other elephants, sharing food and affection with each and every one. It is reasonable to believe that Winkie will mourn the loss of her friend Penny, but now she has six new sisters to share her retirement years and a great new world to explore.